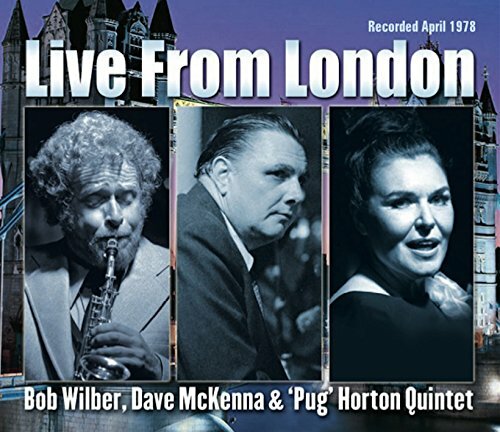 I was stirred to write this because of a gratifying 2-CD release called LIVE FROM LONDON — recorded over five nights of performance in April 1978. The place was Pizza Express, and the band was Bob, reeds and compositions; Dave McKenna, piano; Pug, vocals; and UK stalwarts Ron Rubin, string bass; Derek Hogg, drums. It comes from recordings made by the sound wizard Dave Bennett, and the results are issued on Irv Kratka’s resourceful Classic Jazz label, CJ 36. It is a consistently gratifying two-and-a-half hours of soaring yet casual music. For those of my generation, it is a wonderful window into those New York nights of the Seventies and beyond where a glorious little band would play a three-hour gig and keep delighting and surprising us. The sound is excellent, the music superb. Wilber has often been minimized as one of the great Followers — understandably, because he studied with Bechet — and smaller-minded listeners have been so enraptured by “his” Bechet, Hodges, Goodman, Bigard, and others, that they have forgotten the Wilber-energies that made those sounds come so alive. I think of him as someone like Buck Clayton — completely individual — an artist who made his own identity complete and satisfying while letting the great energies of the Ancestors flow through him. (Is it heresy to write that his Goodman evocation improves on the King?) His sounds are his own (and his compositions are very satisfying as well — whether nicely-shaped “blowing” vehicles like JONATHAN’S WAY or Thirties-evocations like EVERYWHERE YOU GO). Wilber is in fine form here, eloquent and relaxed . . . a modern equal to the great reed masters. Pug (born Joanne) Horton, Bob’s devoted wife, is also singing beautifully on these discs. Although she harks back to the dark ferocity of Bessie and the lighter tenderness of Ivie, she is immediately identifiable and delightful: her sound a purr with British tendencies. And she swings deliciously. And Dave. There has never been a pianist like him and few have come close in the years since his passing. A whole orchestra, a rhythmic-melodic train barrelling down the tracks at us, but a melodic improviser of sweet gossamer subtleties. Each disc has a solo feature or two, and they are magnificent: effusions I would play for any classical pianist who thought jazz players were somehow limited. Here is the CDBaby link — where one can purchase the discs, download the music, or hear sound samples. And the itunes link as well.